Chinese New Year celebration with friends at Fortune. 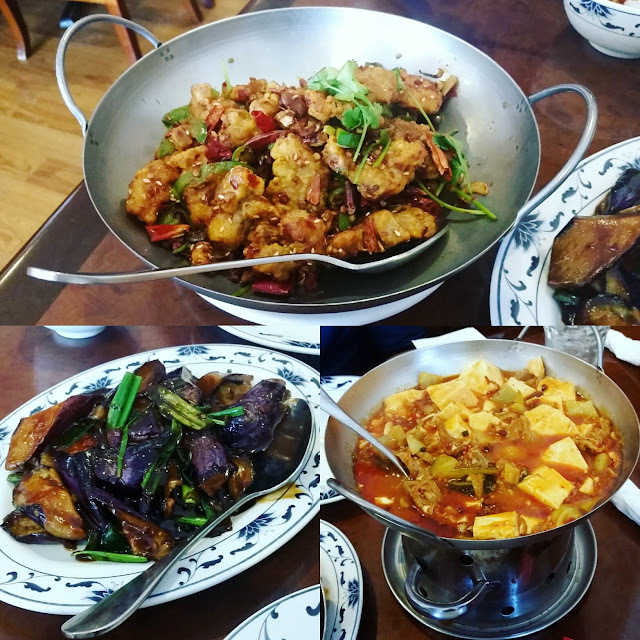 Columbus somehow has a variety of really delicious Szechuan restaurants, while remaining pretty sparse with some of the more stereotypically popular Chinese cuisines like Cantonese and Shanghai. The best way to order food at Fortune is to order from the specials -- there's a page of authentic Chinese special dishes in the menu AND they have a whiteboard of daily specials by the door (which is where the real top notch stuff is at). More Szechuan food at Little Dragon. This restaurant, Fortune (above), and Helen Asian Kitchen tie for my favorite Chinese food in CBUS. 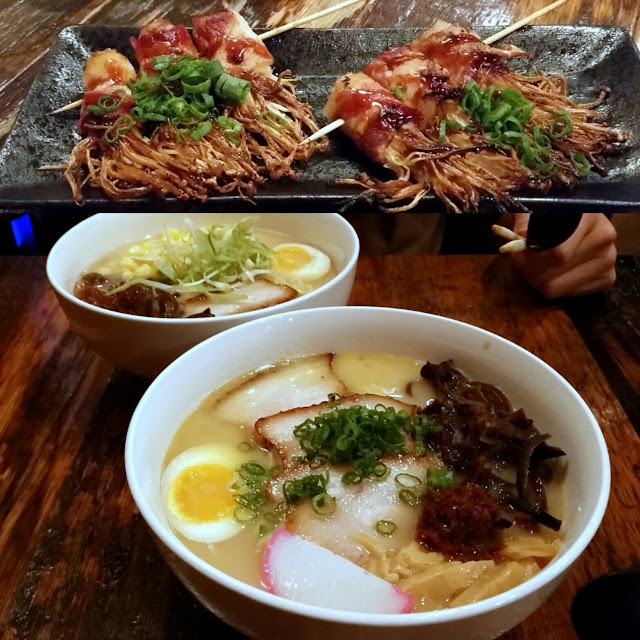 I'm biased to like Helen the best because of the name, and Little Dragon is a little out of the way but it's so tasty that it's always worth the drive. 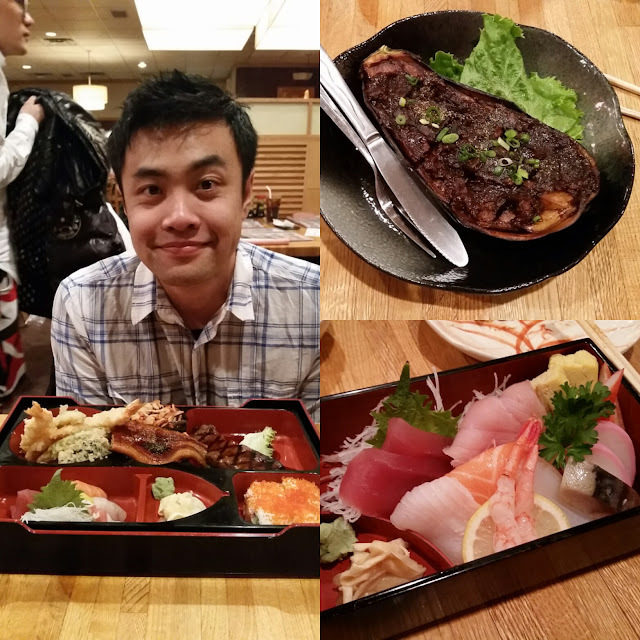 Valentine's Day with babe at Akai Hana. 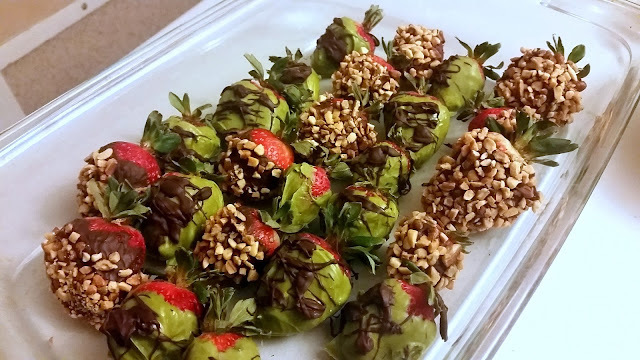 We actually went the day before Valentine's Day for dinner, after I had worked a long Saturday shift in the ER and needed a treat. 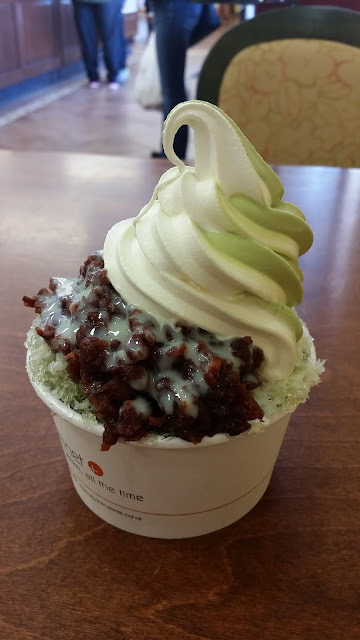 The most delicious green tea shaved ice with red bean and condensed milk, piled high with green tea vanilla swirl frozen yogurt, all courtesy of Belle's Bread. The option for this is not on their regular menu, but rather on a placard at checkout, so most people don't know that you can order this here and everyone was staring in jealously after we got our food puahaha. 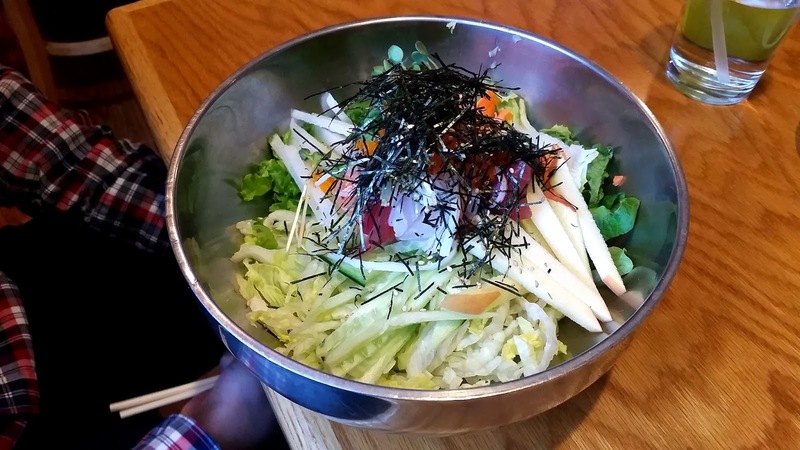 Sashimi bibimbap at Japanese Oriental. This restaurant looks a little sketch from the outside if you're just driving by, because it literally looks like you're going to eat at someone's house, but the inside of the restaurant is quite nice and their food is awesome. They were super duper generous with the amount of sashimi in this dish, and it was only around $10 as part of the lunch special. So worth it. Ramen at Meshikou. They no longer have tonkatsu broth (SAD!!!) but their chicken broth wasn't half bad. And they have this amazing grilled bacon-wrapped enoki mushroom appetizer that somehow reminds me of squid, which must be ordered anytime you visit this restaurant. 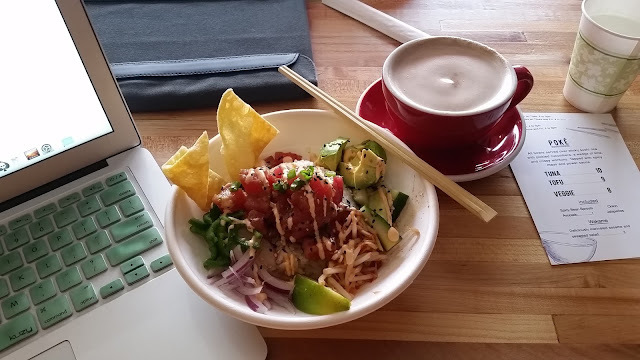 Hai Poke at Red Velvet Cafe -- a new poke popup shop took over the kitchen of a local cafe, where I was trying to get some work done during my lunch break and wanted delicious noms in the meantime. The presentation is beautiful, and although it's not quite comparable to some of the other poke places that I've tried in Los Angeles, it's pretty boss for Cbus. 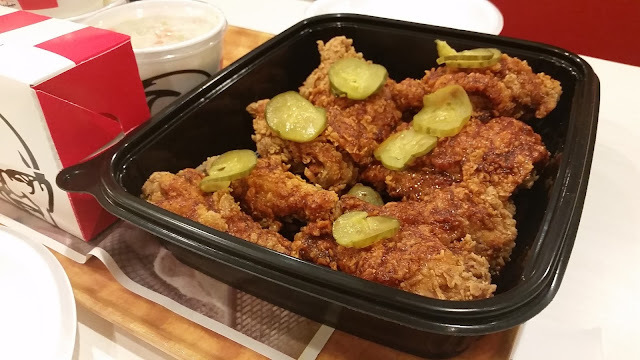 Hot Chicken at KFC. This was only so-so, and it really made me appreciate that we have Hot Chicken Takeover in CBus. KFC gets an A for effort. Homemade blackberry mascarpone cream pie for my weekly Bachelor viewing parties. A group of us get together to watch The Bachelor and eat snacks every Tuesday evening, and we have a bracket which I'm currently winning (but may be losing my lead soon, so sad). I had some extra mascarpone and cream in the fridge, and threw this together. I don't have a recipe persay, but you can make some tiramisu cream and use it to fill a store-bought pie crust, then top with berries and powdered sugar. Super easy peasy. We had some free time this past weekend to take professional photos with my fancy camera, since interview season is not too far away, and we ended up taking some less serious photos at the end. Happy February, and goodbye winter! Lucky you, I wish I lived within walking distance of Little Dragon! :D Hope you give these places a try, thanks Val!